Hooray – Tuppers’ is back! Tuppers’ Hop Pocket Ale and Pils have long been my favorite DC-area beers. Then in early 2007 Old Dominion was sold to Coastal Brewing (a conglomerate involving Anheuser-Busch) and the sale resulted in Bob Tupper ending his contract brewing relationship with Old Dominion. Every couple months I see Bob at a beer tasting and he gives an update on their progress toward finding a new contract brewing partner. Each update gives me reason for new optimism that the beers will be revived – but then months go by and there are still no Tuppers’ beers to be found. That is about to change. Within the next month, Bob and Ellie Tupper will unveil a new creation: Tuppers’ Deep Pockets. Just a few days ago they brewed this Imperial IPA with Jason Oliver down at the Devil’s Backbone in Roseland, Virginia. They even dry-hopped this sucker with Virginian-grown hops! According to the Tuppers’ website, 15 barrels of Deep Pockets will hit the market in about a month. Visit www.TuppersBeers.com for details. Woo-hoo! I can’t contain my glee! Do Pub Closures Kill Community? The front page of today’s Washington Post contains a somber story about mass closings of rural pubs in Ireland. What could be causing the closure of these venerable community institutions in Ireland of all places, the emerald of world pub culture? Ireland’s booming economy is providing younger folks with higher paying jobs far away from their rural homes. At the end of the day, after a long commute, more of these folks are opting for drinks at home in front of the television or weekend vacations to the continent rather than popping down to the pub for a slow round with the neighbors. The article goes on to describe how this is leaving many of the older rural inhabitants stuck lonely and at home when they would rather be celebrating birthdays, anniversaries, funerals and other special occasions with the community at the pub. 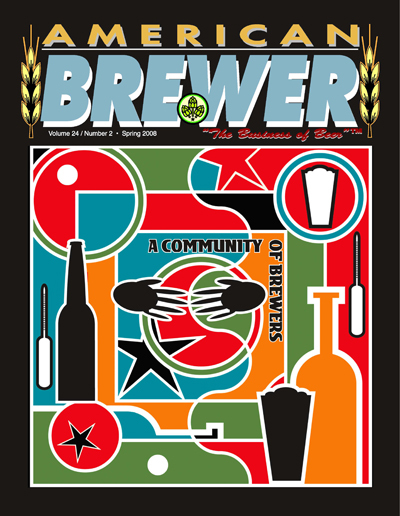 I wrote a chapter in Fermenting Revolution about how so-called “third-places” like brewpubs can help rebuild community bonds in the U.S. Click here to read my Spring 2008 column in American Brewer magazine on the same topic. Much of the mainstream beer marketing works hard to convince consumers that drinking a particular brand leads inevitably to good times with friends and family. Beer is a social beverage, so it is understandable that marketers strive to evoke the fellowship of friendly gatherings involving beer. The implicit suggestion in this is that beer helps to build the bonds of community. But many of the social institutions responsible for building real community have been slowly eroded ever since the automobile began reshaping the American landscape after World War II. Walkable main streets were replaced by strip malls. Corner cafes and taverns closed down as drive-thru fast food chains offered the dubious convenience of eating on the run. Bowling alleys were boarded up across the country as people opted for TV dinners and six-packs of canned beer instead of a night out with the neighbors. In short, Americans moved into isolation in the suburbs. The pursuit of the customized lifestyle has caused a fracturing of community in America. We are a nation of individuals. The closure of the corner bar is a poignant symptom of a community stricken by what author and filmmaker John de Graaf calls “affluenza” – the sickness caused by pursuit of material wealth at the expense of the non-material things that bring real happiness, such as community. Today, many Americans are seeing the symptoms and yearning for a stronger feeling of community. So what makes brewpubs better community places than any other restaurant serving beer and food? The critical difference is that beer is made onsite by a real person. The power of this should not be underestimated. Food (liquid bread in this case) has been the focal point of community ritual since early human society. Alcohol itself has been at the center of these rituals. The conjuring of handcrafted beer at the sacred site of the ritual itself marks a return to an ancient and powerful social bonding experience – brewing and drinking beer in community. Americans seeking a cure for affluenza would do well to visit the local brewpub, or join one of the growing number of beer-tasting groups, or homebrew clubs. Cooperation is a characteristic of enduring communities. It appears often in the craft beer community. For example, Moonlight and Russian River, two breweries in Sonoma County, California, share a hopyard. Cultivating, picking, and the results of the harvest are all shared. Harvest time is a family and friends affair, reviving the community hop-harvest tradition. Two brewers in the same community might view each other as competitors, but instead these companies engage in mutual support. They celebrated this new venture by naming the first brew from their own hops “Homegrown Ale,” an appropriate toast to the power beer has to build strong local communities. Here’s another example that also happens to involve Russian River. Avery Brewing in Bolder, Colorado and Russian River both brew Belgian style beers that each of them independently named Salvation. When the coincidence was discovered, rather than turn adversarial, they chose a path of cooperation. Instead of competing for the rights to the name as might be likely in another industry (or even in this industry among larger companies such as is the case in the ongoing Battle of the Buds), they decided to get make something good out of it – a special new beer brewed together that blends their two Salvations. They called this creation Collaboration Not Litigation Ale. But my favorite example of community in the pub is an experience I had personally at the Great Lakes Brewing Co. in Cleveland, Ohio. I visited the brewery one day for a meeting with owner Pat Conway. As I waited at the bar for Pat to finish another meeting, an older man entered the pub and nodded in my direction as he leaned gently forward against the bar. His appearance elicited a greeting from the hostess and the bartender who immediately served him a glass of water. When Pat appeared a few minutes later, already running late for our meeting and unaware that I was in the room, he stopped first to chat with the old man, addressing him by name and casually inquiring about his general state of being. Eventually introductions were made all around and Pat explained that Mr. Fox, who works at the cheese counter at the West Side Market across the street, is one of Great Lakes’ best customers. Mr. Fox suggested that I try the Dortmunder, which in his opinion, is Great Lakes’ best beer. I invited him to have one with us, but he declined, claiming that he just drinks water these days, and further explaining that he comes in here because he just likes the place and everyone knows him. Without trying, Pat and Mr. Fox had demonstrated the nature of a true community brewpub — the number one customer is no customer at all, just a member of the community.